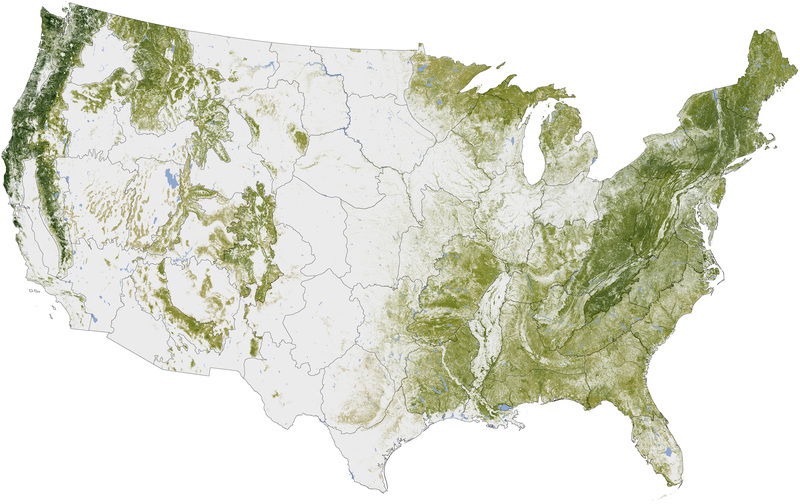 Where the Trees Are in the U.S.
Where the Trees Are : Image of the Day. Click for full humongous size! I’m actually surprised at how bare Michigan’s lower peninsula is as I’ve always thought we had quite an amazing amount of trees. It doesn’t take very far on the freeway to be passing through what appears to be endless forest. Given all the logging that took place in the U.P. I figured that would be a bit less dense, but despite looking pretty good most of Michigan is a sad comparison to places on the west coast. How do things look where you live? As Yoda would say: Begun, invasion of the Multicolored Asian Ladybeetle, has! It’s autumn in Michigan which means it’s time for the swarms of Multi-colored Asian Ladybeetles to start making a nuisance of themselves. The insects look very much like our native ladybugs, but are distinct in several ways including their tendency to invade homes in preparation for the coming winter. I first noticed them last night when I walked in the house after work at 12:45AM and heard a peculiar “tink tink tink” sound as I passed through the dining room. My initial thought was that the faucet in the kitchen was dripping, but checking found that not to be the case and that the sound was now occurring behind me. My next thought was that we had a leak of some sort that was dripping into the dining room, but I was having trouble locating the source of the sound. Pacing about comically sticking one ear out in the way cartoon characters do when listening for something eventually brought me to look up at the dining room light where the source of the sound was discovered. Three or four of the ladybeetles were happily knocking themselves senseless against the dining room light fixture. Then this afternoon as I got ready for work I stepped into the foyer to grab my shoes and found the place home to at least a dozen of the beetles, most of whom where trying to figure out why they couldn’t move through the glass window next to the door and out into the yard beyond. There was another beetle hiding in the bathroom, four more in the dining room, and one totally lost beetle near the back door in the kitchen. Stepping outside and going around to the front of the apartment, which faces the sun this time of year, there were literally hundreds of the beetles plastered to the wall soaking up the rays. What is the correct name of this insect? You will hear several versions of the common name of this insect. It has been called the multi-colored Asian ladybird beetle, multi-colored Asian ladybug, Asian lady beetle and even the Halloween beetle. The name we are most familiar with is multi-colored Asian lady beetle. The scientific name of this insect is Harmonia axyridis. It only has one of these! Where did the multi-colored Asian lady beetle come from? This insect is native to northeastern Asia. How did this insect find it’s way to Michigan? There is some confusion about this issue. There are records of attempts to establish this insect in the U.S. as far back as 1916. In the early 1980’s the United States Department of Agriculture experimented with this insect in the southeast U.S. They were trying to establish it as a predator against aphids and other soft-bodied pests of pecan trees, a valuable nut crop. According to USDA scientists, they were unsuccessful in their attempt to establish the beetle. However, in 1988 an established population was discovered in Louisiana, near New Orleans. The multi-colored Asian lady beetle was first officially reported in Michigan in 1994 but has probably been present since the early 1990’s. Today, it can probably be found in all 83 Michigan counties and several other states. Why do so many multi-colored Asian lady beetles show up in and on my house in the fall and sometimes—lasting right into spring? In the fall of the year, multi-colored Asian lady beetles begin to seek out cavities where they will spend the winter hibernating. They require cavities that will stay cool and dry and offer concealment. Throughout their native range in Asia, the adult beetles seek out cavities in cliff faces and other naturally occurring cool, dry cavities. In our part of the world, they have found equivalent winter quarters in the exterior of buildings. They are most commonly found gathering in the fall on the sun-facing exposure of the building—usually a southern exposure. This activity often results in the beetles getting into the inhabited portions of the building. In the spring, they will all leave. If the multi-colored Asian lady beetle hibernates all winter, why do I get them in my house in the winter? Even on cold winter days there are often times when the wind is calm and it is sunny. On these days (especially later in the winter when days grow longer), there is sufficient radiant energy on sunny exposures (especially southern exposures) to warm the siding. If the temperatures where the beetles are hibernating get near 50 degrees F, some beetles will wake up and begin crawling around. Some or many will then find their way into inhabited areas of the house. When they get into the house during the winter, I see many of them gathered on and around windows, but for the life of me, I cannot find any cracks or gaps around the windows where they may have gotten into the house. How can this be? These insects are photopositive—they move toward the light or towards the window in this case. Insects also have very small brains. They can’t figure out glass and why they can see the outdoors, but can’t get there! They have found their way into living areas by other routes and have only ended up on the window. It’s true that most of the year you’d hardly know they were around, but come about this time in autumn you can’t miss them. They’re pretty harmless and they’re just looking for a warm place to ride out the winter. Some people are allergic to the beetles after prolonged exposure to an infestation, but for most folks they’re just an annoyance. If nothing else, though, they can be a good indicator of the need to check your home for cracks and poor caulking that could result in higher energy bills as they have to be getting in some way. Of course if you use the door on the sunny side of the house then some will just fly in with you, but if you have dozens of them then you’ve probably got a problem some place. My guess for our apartment is that they’re getting in through the vent for the downstairs bathroom which has an external port. I’ll have to ask the maintenance guys to check the screen on it. In the meantime the recommended means of dealing with them in your home is to use a dust buster and just vacuum them up. So that made for an interesting bit of reading on what is a wonderful fall afternoon here in Michigan. It also made me a bit more sympathetic to the plight of the multi-colored Asian ladybeetle. They don’t mean to invade my home, they’re just too stupid to know better. I’ve known some people that were just like that.